Need ideas for your weekly meal plan? I’m listing my family’s menu for the week to give you some ideas for yours. 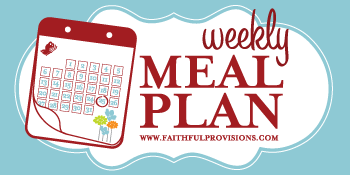 Let me know if you like this and if it helps you out with planning your meals this week. I spent all last week canning–around 60 pounds of tomatoes. While it was definitely time-consuming, it was so worth it. I now have 24 pints of tomatoes and 12 pints of salsa to use throughout the year. Plus, I’ve got five quarts of frozen tomatoes (because I got sick of canning LOL!). So, as you can see, we have tomatoes coming out our ears–even though we haven’t had much rain this summer. It’s a good thing I love tomatoes (and even better that my family does too). In the summer, when the days are long, active, and so hot, we do a lot of sandwiches for dinner–anything to keep from heating up the kitchen! The kids love them and Bradford and I do as well. (There is nothing like a sandwich full of slices of homegrown tomatoes!) Also, this week we have a whole watermelon that we are going to need to be sure we enjoy. Sunday – White Bean Soup (in the crock pot–less heat than cooking it on the stove) with grilled cabbage, sliced tomatoes, and cornbread. Monday – Tomato sandwiches with watermelon slices and a simple garden salad. Tuesday – Crock Pot Roasted Chicken (I have several whole chickens in the freezer that were purchased on sale) with simple sides like steamed zucchini and squash, and Grilled Chile Lime Corn. Wednesday – Chicken Fajitas with homemade salsa and guacamole from the freezer. I have all kinds of peppers and onions from the garden too, for fresh toppings!